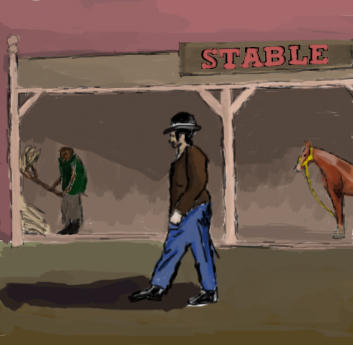 Panel 1: Caption: “With that, Dr. Bailey departed on his horse.” Saul peeks over his shoulder at the large doctor riding his buckskin horse, package of medicines secured behind the saddle, away down the main thoroughfare alongside the saloon opposite Saul’s shop. Panel 2: Saul’s wrist and hand are seen putting keys in the apothecary shop front doors to lock his shop for the night. Panel 3: Saul, in profile, contemplates his first day as a pharmacist. Behind him is the apothecary shop complete with sign “Solomon Sibley apothecary.” The setting sun painted the sky purple and blue. Caption: “Saul locked up his apothecary shop and then stared at the sunset, contemplating his first day working for himself…” A fuller view of this panel available here. 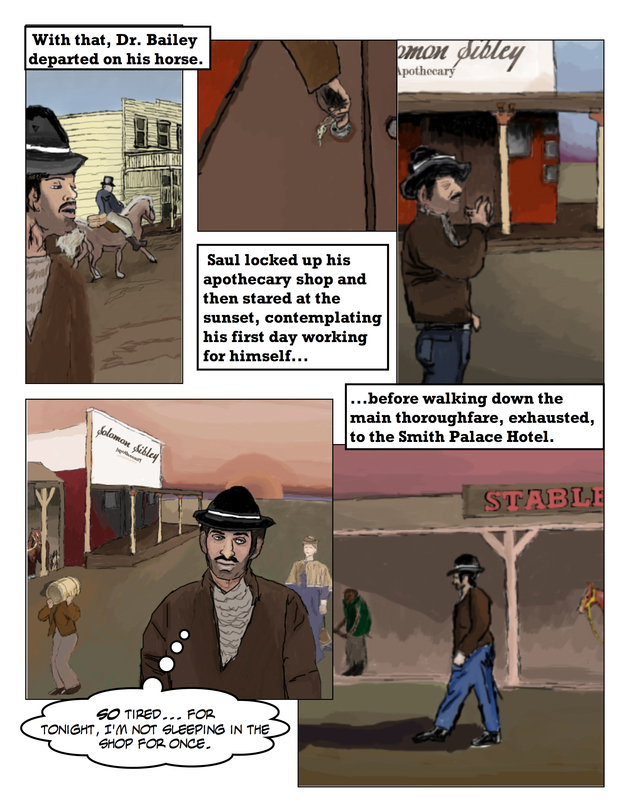 Panel 4: Caption: “…before walking down the main thoroughfare, exhausted, to the Smith Palace Hotel.” Saul’s in the foreground in the dusty thoroughfare, wearing the same brown coat and black hat as before and walking exhaustedly west. “So tired… for tonight, I’m not sleeping in the shop for once” Saul’s thought bubble reveals. Around him are other people, an older lady in a shawl holding a purse and a guy in a vest lugging a barrel on his shoulder, moving down the thoroughfare, going about their business. Behind them stands the apothecary shop, with the “Solomon Sibley apothecary” lettering displayed prominently on the facade above its porch roof; beside Saul’s shop due west sits the town’s most used livery stables, horses to rent or to buy. Bonus points if you saw the horse at left already; he’s got a Sorrel color with white spots on the face (HORSE CLOSE-UP). Backgrounding all is an impressionist sunset of orange layers. 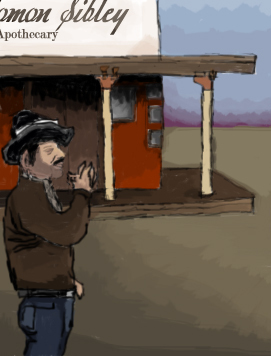 Panel 5: Saul continues his walk west past the livery stables. The Sorrel horse seen in Panel 4 makes an encore appearance in Panel 5, beneath the stables’ sign, reading “STABLE.” Also within the stable is a guy using a hay rake to move hay for the horses. The magenta and orange layered sunset covers all, and casts a westward shadow in front of Saul. A much better view of this panel available here. © 2012, Nick Dupree, all rights reserved, educational use is not just allowed, it’s encouraged! Please email me for educational or commercial use.